Nissan pulled the wraps off its one-of-a-kind Titan Surfcamp, a completely decked-out pickup inspired by the vintage beach trucks of the '60s and '70s. The Titan Surfcamp will be shown to the public for the very first time at the International Convention of Allied Sportfishing Trades (ICAST) in Orlando next week. What better way to relish the heat of the summer than by heading out to sea and reeling some big ones? Whether you like to grill your catch or simply release, you're going to need the right equipment for the job. 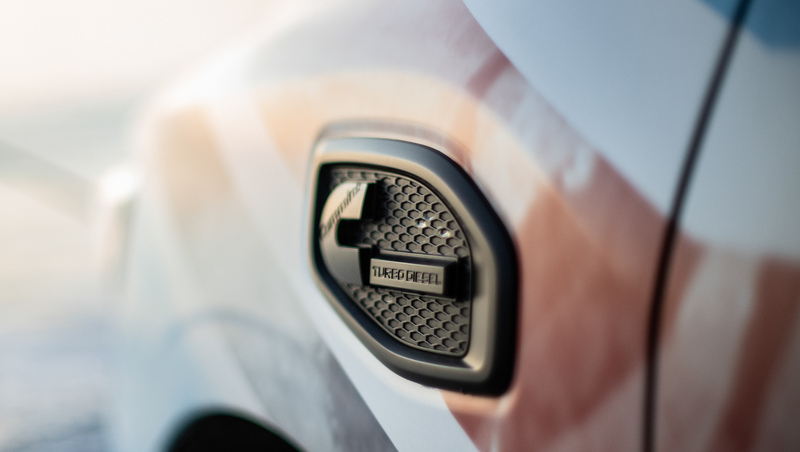 The Titan Surfcamp started out as a 2018 Titan XD Midnight Edition, which was transformed into its current glory through a plethora of aftermarket accessories. Equipment such as a roof-top tent, a roof rack, a bed rack, and a clever bed drawer system that utilizes the Titan's Utili-track bed channel system was installed in order to haul all the gear necessary for a beachside adventure. Of course, toys and coolers are always needed in the summer, so paddle boards, surfboards, and a sweet Yeti cooler to keep adult beverages cold were also installed. 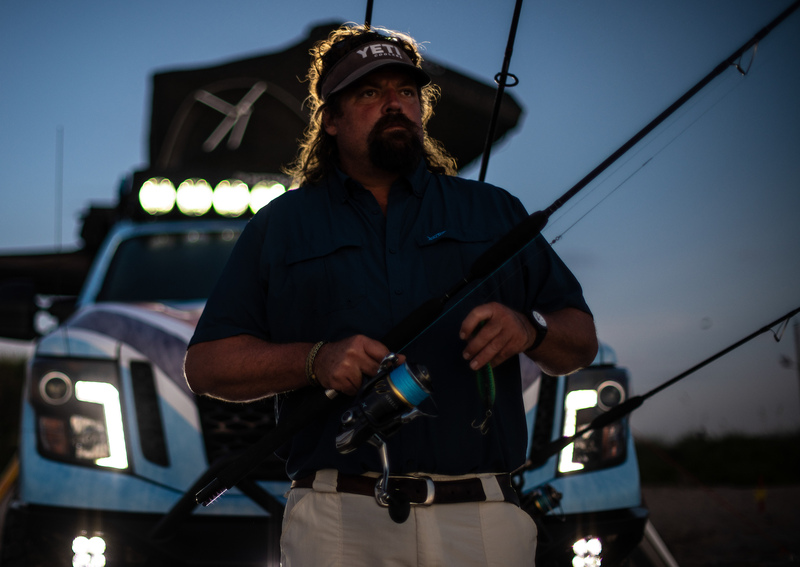 When it comes to fishin' gear, custom rod mounts were installed at the front of the Titan to make sure the gettin' is good and for a long, long time. While the eye candy is strong with this one, it must be noted that the Titan Surfcamp is still 100 percent usable and not just a showboat (see what I did there?). Under the hood, there is a powerful 5.0-liter V-8 turbodiesel Cummins engine with 390 horsepower that rotates the 17-inch Icon Alpha wheels wrapped with Nitto Ridge Grappler tires. In addition, the factory-authorized three-inch suspension lift kit allows the Titan to get to the perfect fishing spot along the coast, wherever it may be. While the basics of off-roading and fishing are more than covered, it wouldn't be a "proper build" without some swanky goodies, and it's fair to say that the Titan Surfcamp's got them. For starters, there's the cool wrap applied to the truck which was inspired by a 1971 Datsun BluebirdWagon Hot Wheels car nicknamed “JNC Surf Patrol,” some front-end body armor courtesy of Fab Four, some wet-suit-like seat covers, and even a solar-powered shower complete with a teak wood deck to rinse off the sand before hitting the road. "With Titan Surfcamp, it's never been easier to hit the beach," added DePerez. "I hope this amazing show truck inspires surfers, fisherman and beach lovers to add Titan to their weekend adventures." Nissan did not reveal the cost of this awesome one-off, but they claim that almost every item on the upgrades list "could be purchased by the general public through aftermarket sources" in order to create their own. The Titan Surfcamp may not possess the capability to grill and smoke meat like Nissan's delicious Smokin' Titan, but I must admit that this is one of the coolest trucks I've ever seen.